For you and your imagination to flexibly create, display and share color-coded information. 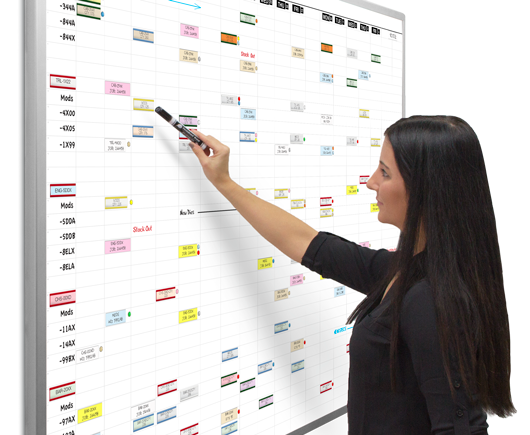 Quickly lay out an instantly changeable display of your projects, tasks, plans, activities and resources with these magnetic dry-erase steel white board kits. The kit supplies are carefully selected to fit the board and ready to use with everything needed to operate it. The wide range of all purpose magnetic whiteboards and visible card display boards on this page are the ones our clients tell us have been the most successful in their operations. When you order from us, online or by phone, the whiteboards are shipped quickly and will arrive at your door with all of the accessories you need to start using them immediately. Our magnetic dry erase whiteboards are durable and meant for a lifetime of daily use. Whether you need to manage budgets, oversee manufacturing jobs or maintain inventory, the magnetic whiteboards you buy from us help you get the job done. Keep your team or department on task and on time through clear, visual communication of to-do's, priorities, and progress toward goals. Use our magnetic dry erase whiteboards again and again. Let one of our experienced design specialists help you select the right magnetic dry erase whiteboard kit for your requirements, whether your needs include tasks like scheduling employees or planning projects. Talk to our specialists without obligation; products you purchase from us are made in America, and we ship in 3 business days or less. We are a veteran-owned business that makes durable products for business and professional use. We take pride in making our proprietary magnetic dry erase whiteboard kits for all employment settings; our products stand up to hard use and are made to serve you reliably in your workplace. "We love the whiteboard! I would like to place a duplicate order to the same exact specifications."